WESTERN Australia’s central wheatbelt farmers are being encouraged to inspect pastures and crops for locust activity to plan potential control measures. The Department of Agriculture and Food has begun surveying for Australian Plague Locusts in the central wheatbelt and is reminding farmers to check paddocks for activity. Department Invasive Species manager Tim Stevens said targeted surveillance had begun around Merredin and surrounding areas ahead of locust activity predicted across eastern and southern parts of the grainbelt during spring. “Staff will survey pasture paddocks focusing on potential high density areas first which have been identified from the autumn survey data,” Mr Stevens said. 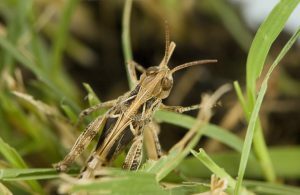 Landholders are reminded to inspect their properties for locust activity and start preparing for control if necessary. “Spraying at the right time will help landholders protect their investment in crops and pastures,” Mr Stevens said. Department entomologist Svetlana Micic reminded landholders who had observed locust activity on their properties in autumn to be particularly vigilant, as it was likely there were egg beds which will hatch in spring. “Pasture paddocks in particular should be checked. “Locusts favour areas of compact, bare soil to lay eggs, including around dam banks, roaded catchments and fencelines,” Ms Micic said. Autumn surveys completed by the department indicate moderate density hatchings are likely, which may result in locust bands and loose swarms, in parts of Ravensthorpe, Jerramungup, Gnowangerup, Lake Grace, Kulin, Yilgarn, Westonia, Mukinbudin and Nungarin shires. Variable hatchings are also likely to occur in other parts of the southern agricultural region and wheatbelt. Peak hatchings are expected from mid-September in the central regions and from mid-October in the southern region. Control this spring will also play a role in limiting potential locust numbers building up over summer and into autumn 2017.